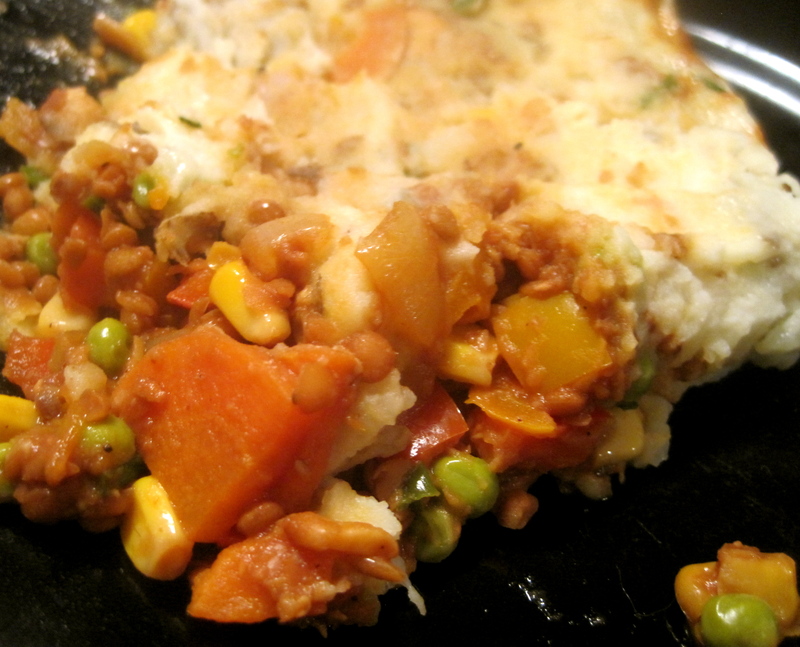 I made this shepherd’s pie with my lovely roommate Julia on a rainy spring night, and it proved to be the ultimate comfort food. A warning though: I don’t have an exact recipe for how I made it because we went pretty crazy with the spices. It was basically a free-for-all in the spice cabinet, grabbing big pinches of this and a shake of that and a splash of whatnot. In one of my cookbooks, the picture following a particularly complicated recipe is just a picture of the chef’s massive spice collection, and I feel like I should have an image like that for this post. I’ll post what I recall using, but this means you should feel free to use this recipe as a template and improvise on the spicing however you want! 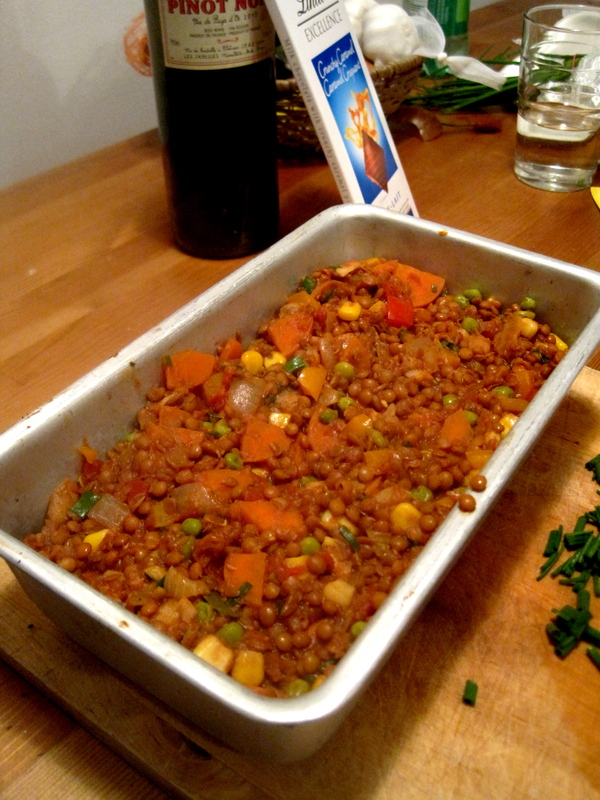 My measurements for the vegetables are also pretty approximate (and I’m posting a recipe why?) so feel free to adapt the vegetables based on what you have handy–I think zucchini would be an excellent addition. SPICES/flavorings! I recall using: cumin, smoked paprika, chipotle chili powder, cayenne, cinnamon, nutmeg, thyme, black pepper, soy sauce, red wine vinegar, red wine, a spoonful of bouillon paste, tomato paste. 1 1/2 cup grated cheese–I used a mix of aged cheddar and smoked mozzarella. I definitely recommend using at least one smoked cheese. Omit and you have a vegan pie! Put a large pot of water on to boil for your potatoes. Put another pot on, heat up your oil, and add your onions. Cook onions for a few minutes, until they become translucent, then add your carrots and bell peppers. 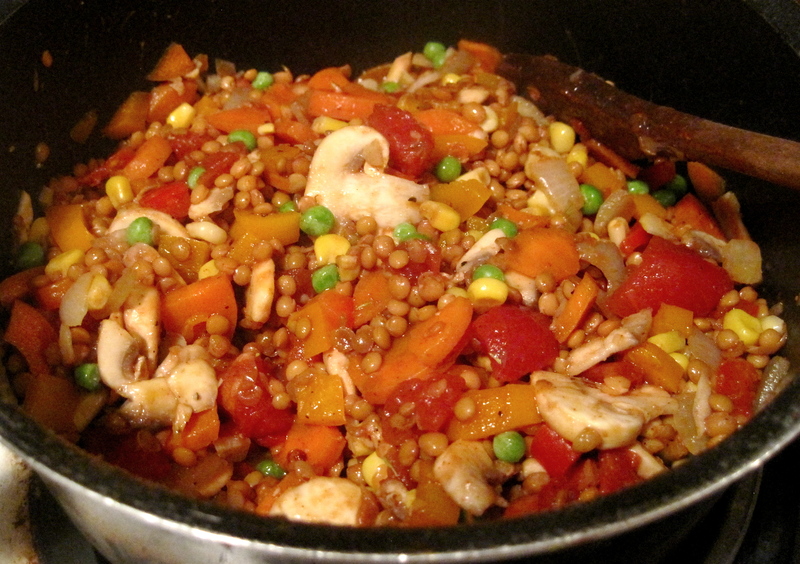 Cook for another five minutes, then add your mushrooms, peas, corn, lentils, and tomatoes. When your water boils, add a teaspoon of salt and your potatoes, and simmer for 15-20 minutes or until fork-tender. Add spices and flavorings of your choice to your vegetables and cook for another 10-15 minutes, adding more oil as necessary but making sure the mixture isn’t too liquidy towards the end. Taste for salt and seasonings. When potatoes are done, drain and mash with butter and more salt and pepper. Preheat your oven on a high broil setting. And now it’s time to assemble your pie! Notice the wine and chocolate in the background–perfect comfort food pairings. I used a loaf pan for a thicker pie, but these proportions should work for a 9×9 casserole dish. 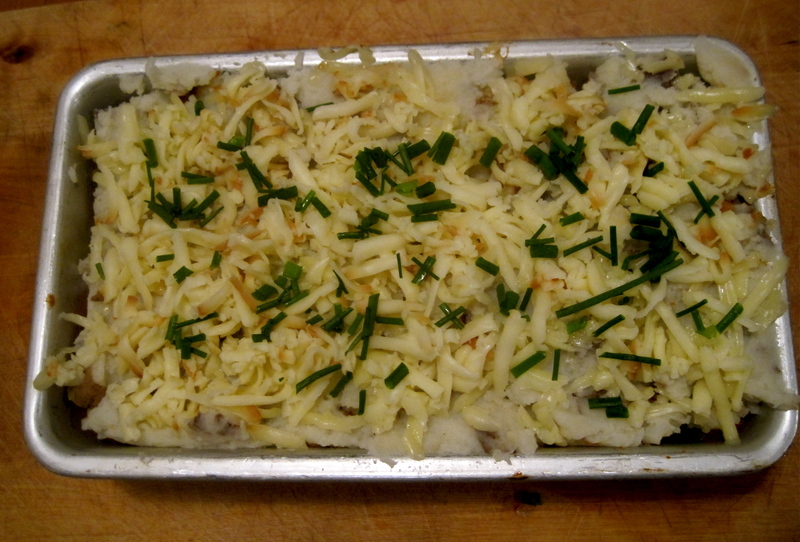 Spread your veggie/lentil mixture across the bottom, then spread your mashed potatoes on top, then top with a layer of grated cheese and finally, a layer of chives. Put in the oven for 5-10 minutes depending on how long it takes for your cheese to start to brown on top! 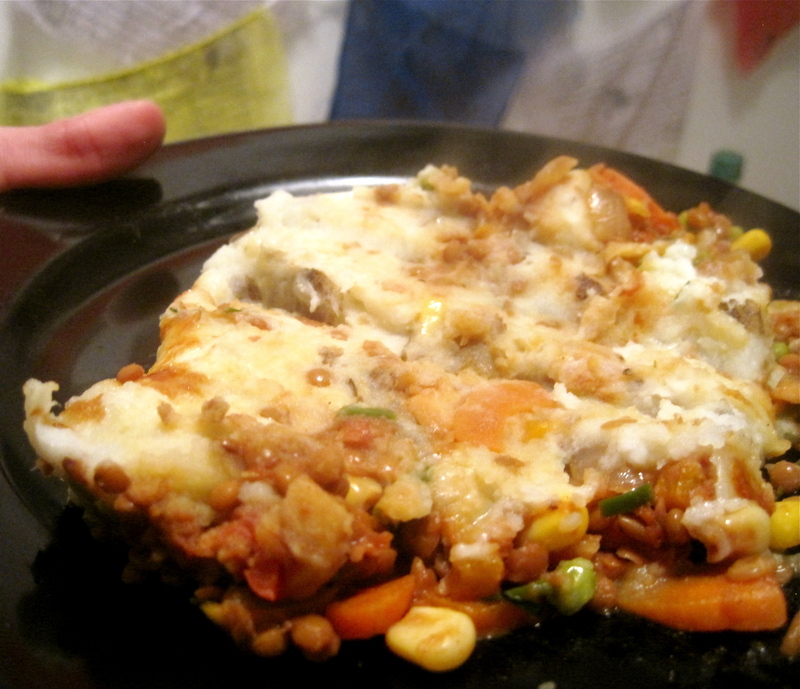 Slice into hearty servings, serve messily, and consume and be comforted!